Happy New Year!! 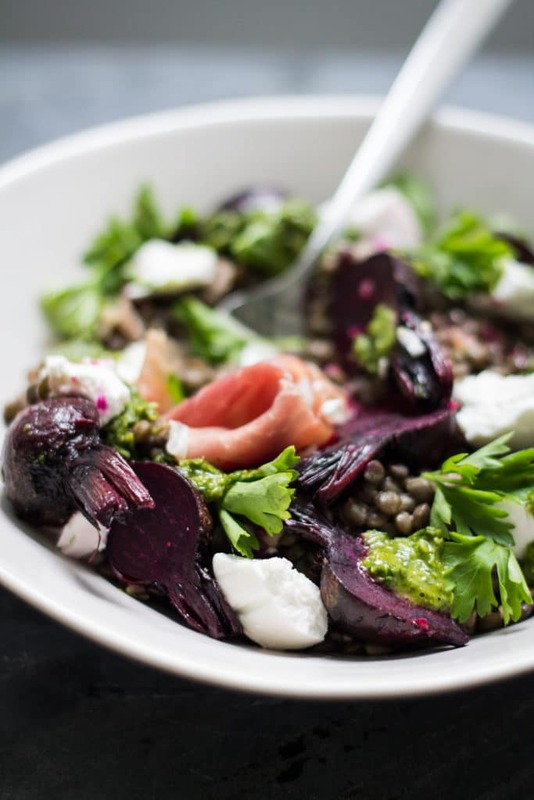 Happy Beetroot, Herb and Goat’s Cheese Lentil Salad! I think 2017 is going to be a great year! I guess this is where I should be confessing to you all my New Year’s resolutions for 2017…eat more greens, buy less shoes, Kondo more, eat less fries (they all sound good resolutions and super fun right? ha! )… but whenever I have made New Year’s resolutions I stick to them for about two weeks, feel completely guilty over not sticking to them or oppressed when I am sticking to them and then wonder why on earth I made them in the first place. I’m all for having goals but I’ve decided that New Year’s resolutions are so 2016 and so not on trend for 2017! Feel free to join me if you want to be a cool kid like me too. Now that we have got that silliness out of the way let’s talk lentil salad. 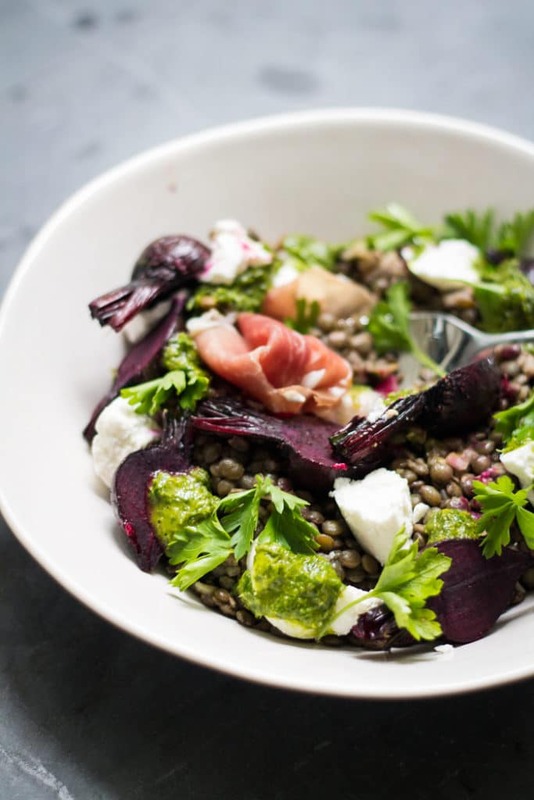 Beetroot, Herb and Goat’s Cheese Lentil Salad to be exact. Someone once told me that it’s good luck to have lentils on New Year’s because the little lentils look like cute little coins symbolising wealth and prosperity. I like the sound of that, could be especially handy when wanting to buy this year in Auckland’s housing market, so we’re having lentils today folks. I don’t know if you have lentils much but if you don’t I seriously think you need to consider introducing these little friends to your life (could even be a NY resolution if we were doing those silly things, but we’re not, so never mind). 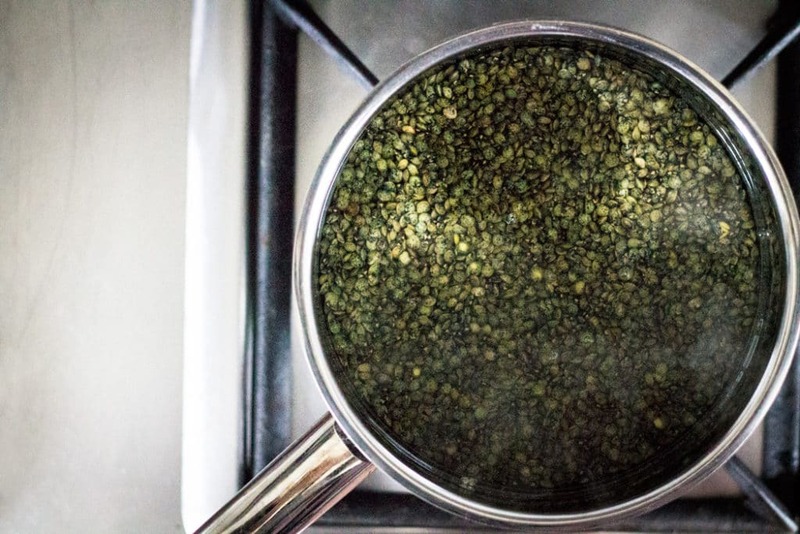 Lentils are super cheap, easy to make (Can you boil water? Okay you can cook lentils then. You can’t? Well seriously, what are you doing here? Try this and get back to me.) and are full of all those good things like folate, magnesium, fibre and lots of protein. 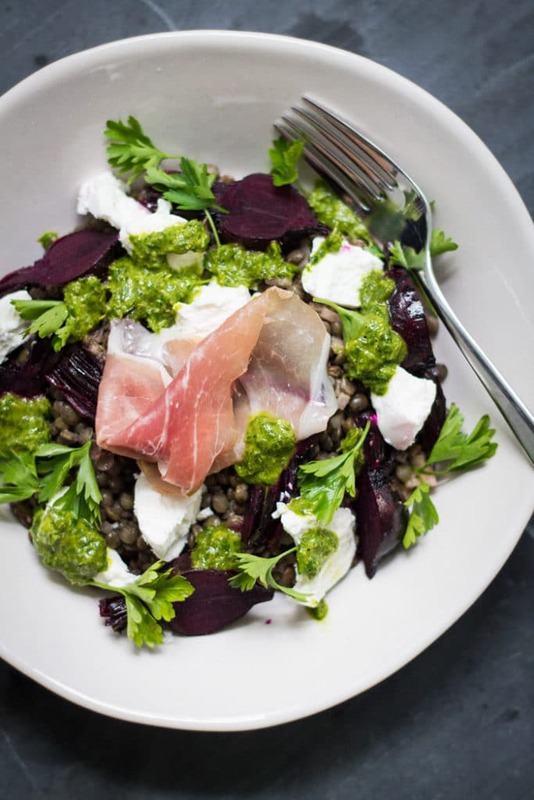 I do admit I have used the most expensive lentils (French lentils) for this dish because they retain their shape and texture after cooking so I think are best for salads but they are still pretty cheap. You can find them with all the soups and dried legumes in most supermarkets or in health food stores. 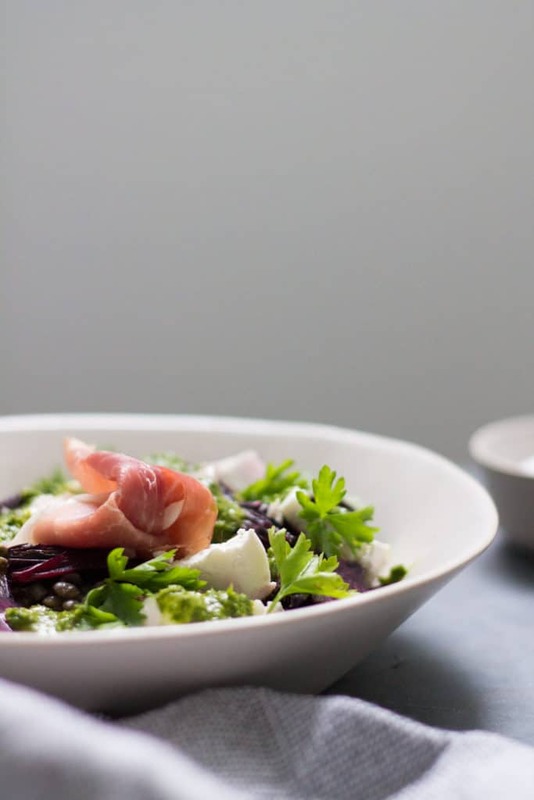 Beetroot, creamy tangy goat’s cheese and fresh herbs are seriously a match made in heaven. I wish I could lay claim to coming up with this genius combination but you all know that these are a tried and true flavour combo. 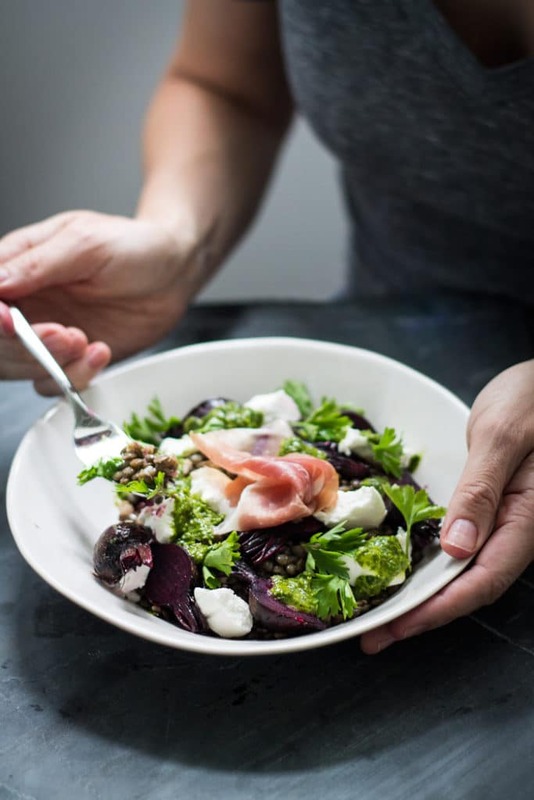 Team them up with earthy nutty lentils, delicate shallot, tangy vinegar and salty prosciutto and you have one delicious salad. 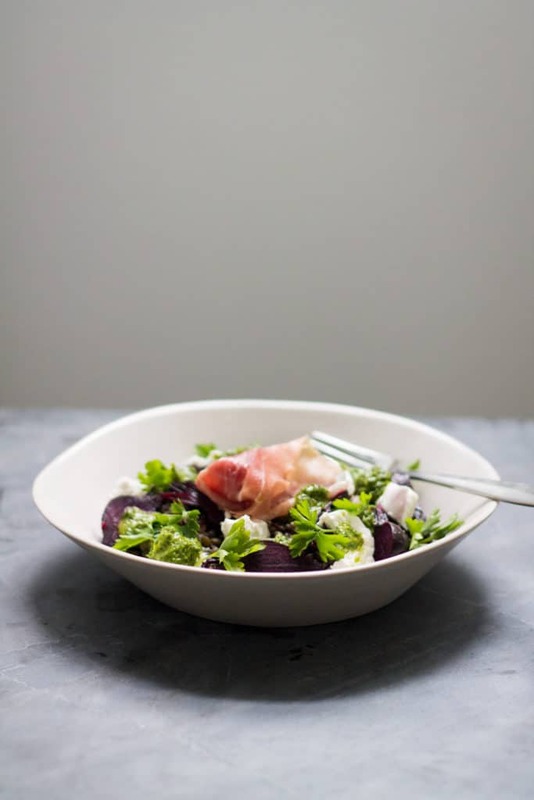 If you’re vegetarian then feel free to leave out the prosciutto, I often do especially if I’m doubling up the recipe and making it as a big salad to share. I know it’s cold and wintery in the Northern Hemisphere right now and this is perfect served warm, just keep the lentils covered with some aluminium foil while you prepare the rest of the salad, it is just as perfect for picnics in the summer Down Under, box it up and serve it at room temperature. A picnic is definitely my favourite way of serving it! So Happy New Year wonderful people may 2017 be your best year yet! Preheat oven to 200C/400F on fan-bake. Place lentils in a small saucepan and cover with 5cm/2in of cold water. Do not salt the water because it can make the lentils tough, it is best to season the lentils once they are cooked. Bring to the boil then reduce to a simmer for 20 minutes or until tender - this may take more or less time depending on the individual batch of lentils so make sure you taste test them. You still want the lentils to have a bite to them. 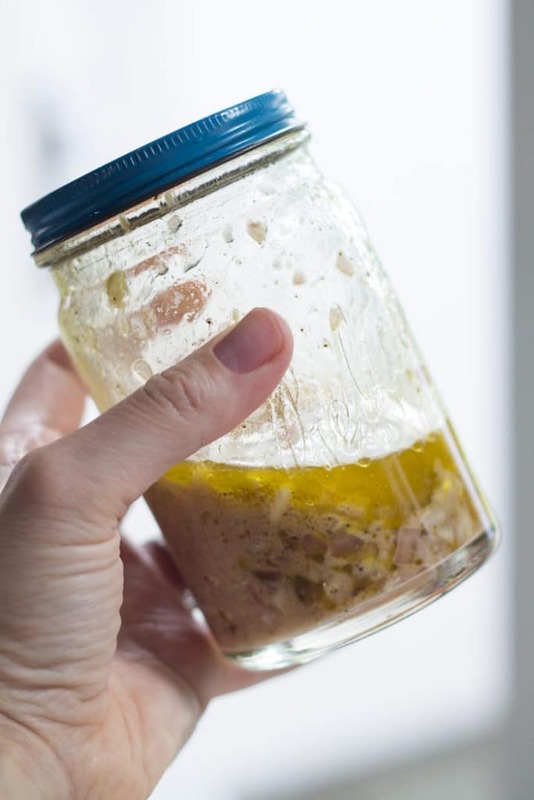 Make the dressing for the lentils by placing shallot, 3 Tbsp olive oil, red wine vinegar, mustard, 1 tsp sea salt and 1/2 tsp freshly cracked black pepper in a small jar and shaking to combine. Remove lentils from the heat and stir though the dressing while the lentils are still warm. While the lentils are cooking, place beetroot on a baking tray lined with baking (parchment) paper. Drizzle with oil and season with sea salt and freshly cracked black pepper. Roast in a pre-heated oven for 20 minutes or until beetroot are firm but tender. Remove from the oven and slice in half. To make the green sauce place the parsley, thyme, lemon zest and juice, 3 Tbsp olive oil and 1/2 tsp sea salt and a good pinch of freshly cracked black pepper in a blender. Blend until almost smooth (I like a few specks of herbs in there) then check the seasoning. 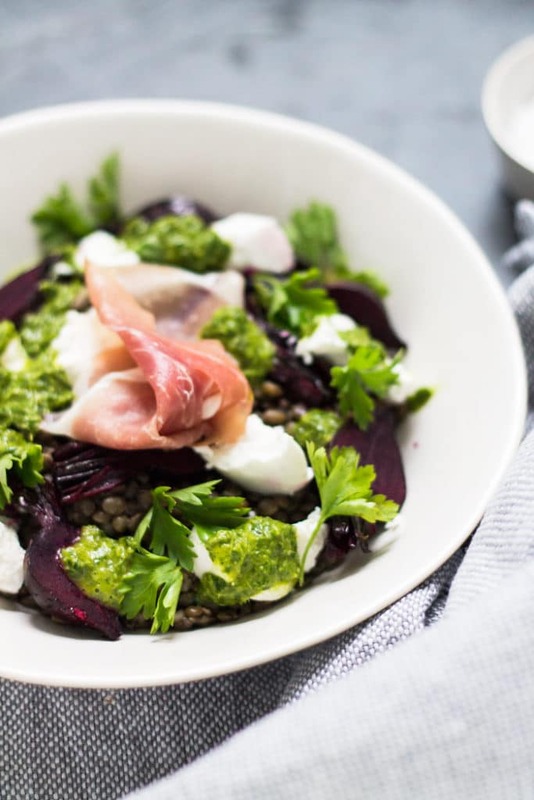 To assemble divide the lentils between two serving plates, divide the beetroot and prosciutto and scatter over the goats cheese and parsley leaves. Drizzle with the green sauce and serve. Great served warm or at room temperature. If you can't find any baby beetroot you can use regular sized beetroot allowing 2 medium beetroot per person. To cook, preheat oven to 180C (350F). Wash then top and tail the beetroot. 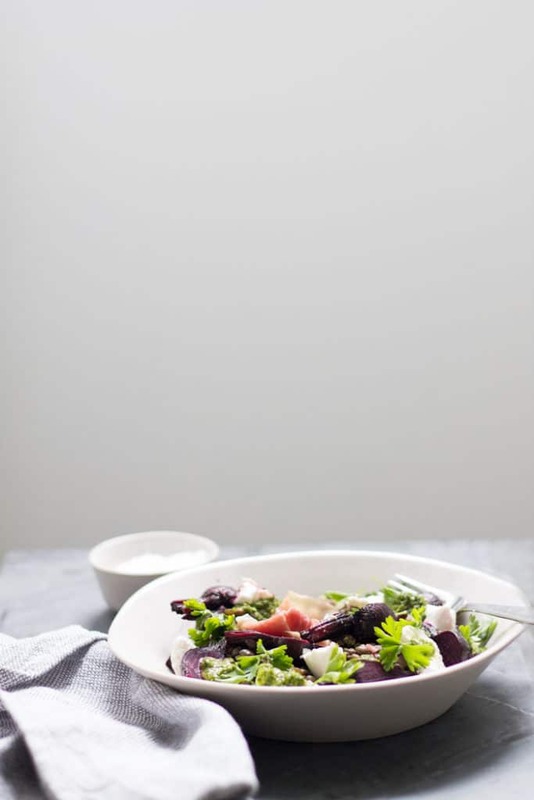 Place beetroot on a sheet of aluminium foil, drizzle with 1 Tbsp olive oil, season then wrap half the aluminium foil over the beetroot to create a sealed pouch. Place on a baking tray in the oven and bake for 1 hour. Allow to cool enough to handle then peel and slice into wedges. You may like to use disposable gloves when doing this so your hands don't turn bright red! To make this meat free then omit the prosciutto. 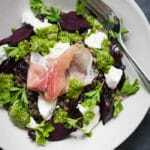 Great dish, those earthy sweet flavours of beetroot are really something to celebrate and they go so well with goats cheese – here in the UK Ticklemore is just perfect but even Wensleydale a crumbly white cow’s milk cheese with sour notes works well too. Happy New Year! Yes, aren’t they are perfect flavour combo? Those goat’s cheeses sound quite delicious, you really have some great cheeses over there in the UK. Hopefully I’ll get back over there one day to do some sampling! Happy New Year to you too Keith, I hope it’s a great one for you!